The Statistics Education Research Journal is IASE’s peer-reviewed e-journal, co-published with the ISI. SERJ aims to advance research-based knowledge that can help to improve the teaching, learning, and understanding of statistics or probability at all educational levels and in diverse contexts. Note: The SERJ archives also contain links to earlier newsletters: the Statistical Education Research Newsletter (2000-2001) and the Newsletter of the International Study Group for Research on Learning Probability and Statistics (1987-1999). If you are an IASE member, you should be receiving an email from IASE every few months. The Members page tells you how to proceed if you are not receiving emails. IASE Review is an annual review of IASE activities. International Statistical Review➶ is the flagship journal of the International Statistical Institute (ISI). It occasionally publishes significant articles on statistics education, such as these. An archive of the IASE sections of the ISI Newsletter and its precursor series. ... was a four-page insert that appeared in each issue of the journal Teaching Statistics➶. It described recent and future conferences, publications, etc. 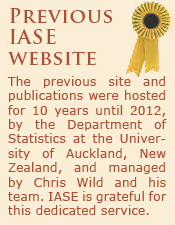 of IASE and other organizations around the world that are of interest to readers of Teaching Statistics. There are a few thousand papers available from conference proceedings. See Conferences for descriptions of the various types of conference, e.g., ICOTS, ISI Congresses, IASE Satellite Conferences and IASE Roundtable Conferences, and IASE sponsored or organised sessions at other conferences such as ICME and JSM. This project provides information, resources, and links to downloadable materials for those interested in developing national poster competitions and conducting school projects that culminate in a statistical poster. The ISLP is also planning to provide educational resources that can help the development of statistical literacy of learners and citizens at all educational levels, from from Primary/Elementary to college and Adult Learners, as well as materials for journalists and official statistical agencies. The Training of Statisticians Round the World (1987), (ed. R.M. Loynes, pub. ISI) The report of the ISI Task Force on Technical and Tertiary Education in Statistics. An effort was made to include chapters on all major regions in the world and to describe how training of statisticians is arranged in each of the countries included in the report. Teaching Statistics in Schools throughout the World (1982), (ed. Vic Barnett, pub. ISI) The report from the ISI Taskforce on Teaching Statistics at School Level, it provides a review of the nature of statistical education at the time in 16 developed and developing countries. ... an archive of doctoral dissertations in Statistics Education since the year 2000. Hipotesis Alternativa is a newsletter containing Spanish translations of portions of the IASE component of the ISI Newsletter and of the IASE Review. It is not an official publication of the IASE, but is listed here since it draws heavily on IASE publications and makes its contents available to speakers of Spanish.